Super Luck Heightens the critical-hit ratios of moves. This Pokemon has a higher chance to hit critically..
environment. This POK�MON very rarely ventures down from the mountains. Emerald It sharply senses even subtle changes in the sky and the land to predict natural disasters. It is a long-lived POK�MON that has a life-span of 100 years. Leaf Green It appears when it senses an impending natural disaster. As a result, it was mistaken as a doom-bringer. Diamond/Pearl It senses coming disasters and appears before people only to warn them of impending danger. Platinum Rumored to sense disasters with its horn, it became a target. It fled deep into the mountains. Heart Gold It has the ability to foretell natural disasters. Its life span is over a hundred years. Soul Silver It has the ability to foretell natural disasters. Its life span is over a hundred years. Black Rumored to sense disasters with its horn, it became a target. It fled deep into the mountains. 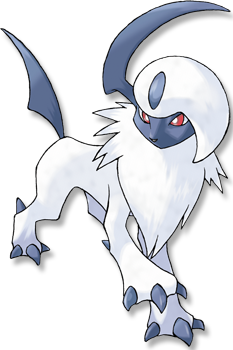 White Rumored to sense disasters with its horn, it became a target. It fled deep into the mountains.